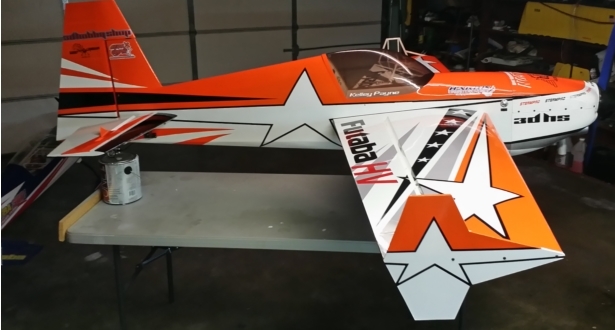 I’d just like to tell a little about my 104″ 3DHS Slick Giant Scale RC Airplane. This 26 lb. airplane is powered by a Desert Aircraft DA-120 cc 2 cylinder gas engine which produces about 12 horsepower at 6800 rpm’s. The engine is mounted onto the engine motorbox by a Aerolite Mfg DA-120 one inch aluminum cnc machined standoff mount. It is supplied fuel from a 32 ounce tank located inside the fuselage near the front of the airplane. The fuel is a 91 octane gasoline mixed with a 2 stroke oil at a mixture of 40/1 which means that there is 40 parts of gasoline to 1 part oil. The control of the airplane is handled by a Futaba 14sg 14 channel radio control system that uses the 2.4 frequency band, and is operated by a transmitter on the ground and a receiver inside the aircraft. Inside of my airplane there are two Futaba high voltage 7.4 volt receivers and 8 high voltage Futaba BLS172SV servos with over 500 inches of torque at 7.4 volts. The receiver acts basically as the brain of the aircraft and the servos act like the muscles. The servos get their signals to move from the transmitter and then through the receivers, once told to move the servos rotate their arms in the direction they are told to move which moves the control surfaces such as the ailerons, elevator and the rudder. I chose to use dual receivers for redundancy, each receiver controls one side of the aircraft so that if somehow one receiver is damaged or fails to read the signals from the transmitter the other can still control it’s half of the airplane. The radio system in the airplane gets it’s power from two lithium polymer 2 cell 7.4 volt 3,300 mah Thunder Power rechargeable batteries. These two batteries plug into a Fromeco Wolverine switch independently and are shared by both receivers. The Fromco Wolverine switch is made to share the batteries, if one battery for whatever reason fails then the switch will automatically switch to the other battery. The Desert Aircraft DA-120 is fed the gas mixture by a fuel system that uses a 32 once Fourtitude fuel tank, which will allow anywhere from 7-12 minutes of flight time depending on the use of the throttle. I also have a smoke system that can be turned on or off by a toggle switch on the Futaba transmitter, and can be adjusted to get the perfect mix of heat from the engine exhaust within the mufflers. The dual mufflers are Desert Aircraft Compact 120’s which have a single jet installed into each one that allows smoke oil to enter the muffler and sprayed into the hot exhaust stream where it vaporizes into the smoke. I am also using another 32 once Fourtitude tank that is designed not for gasoline but for smoke oil. The oil is pumped out of the it’s tank by a Harris smoke oil pump and through a a one way check valve that only allows the oil to travel towards the mufflers and not back. I’ve recently designed a se of Side Force Generators (SFG’s) for the 104″ 3DHS Slick which aid some in knife edge flight and flat rudder turns, please they just look pretty cool to me.